When I was seventeen, my dad and I packed a few of my most important belongings into our minivan and left my home in the mountains of the Pacific Northwest, heading to an elite college in Connecticut (called, innovatively, Connecticut College). Mt. Rainier, my abiding love, disappeared over my left shoulder as I took Hwy 7 over the Cascades, to connect with I90. I left behind my family, my home and my access to good coffee. 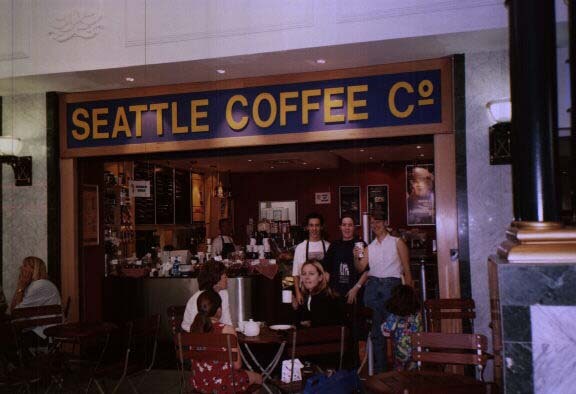 The year was 1996, and Starbucks was in the first few years of its astonishing ascendancy. It was a matter of identity for a northwest kid to proudly announce their drink order. Were you a mocha girl? A latte guy? Or did you fancy a cappuccino? I remember horrifying my fellow youth symphonians by telling them just how unbelievably far away the nearest Starbucks was from my home (almost an hour). I had a set of four “favorite” Starbucks for the routes I took most. I bought in, hook line and sinker. I used to bring three cups of coffee to school – one to drink in the car, one to drink in my first class and the third in a thermal tumbler I left in my locker for my second class. I was all in on coffee. That April, I’d been completely taken in by an NPR prank about Starbucks building East/West coffee pipeline. I was a little preoccupied about the coffee question on that long drive across Montana and North Dakota. My four years at college were spent in a veritable caffeine desert. The closest Starbucks was in Cranston, Rhode Island, but I didn’t have a car. Eventually my long-suffering boyfriend got a car, but lacked a sense of direction which added a good 20 minutes to the Starbucks run. It happened only a handful of times a year. I accepted my caffeine-isolation as the price of education (although there are a few stories about what my friends were forced to do in order to get me to a Starbucks). But when my now-husband brought me to our first shared home in Roslindale, I had high hopes that I might – for the first time in my life – live within easy access of a Starbucks. That hope was dashed – the nearest one was quite a way away. There was one near church I stopped at religiously, but certainly none within walking distance. Nor was there one near my then-office. Two years later, we moved to Malden. The Starbucks perimeter held firm. I changed jobs, and still was not near a Starbucks. We moved to Stoneham. If you draw a circle around my house, you would find I’m in just about the furthest possible location from any Starbucks. I was appalled to learn that Stoneham, when wooed by a Starbucks, didn’t enthusiastically support the project, but blocked it. Really, selectmen, the town is now sufficiently supplied with nail salons, convenience stores and liquor stores. But we’re terribly underserved by purveyors of fine caffeine solutions. Since then, I’ve changed jobs twice. 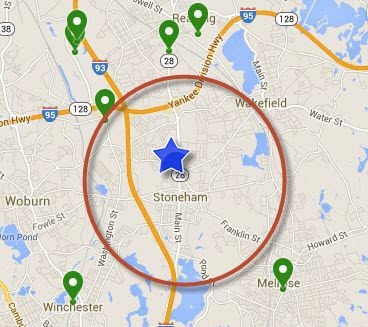 It wasn’t a huge surprise that the Billerica location was not close to a Starbucks. But when I got a gig in one of the most cutting edge districts of Boston, I was ready for my luck to change. At last, finally, I would have easy access to a Starbucks – for the first time in my entire life! I could go grab a cuppa in the dark stretch of afternoon. I could swing by in the morning if I was running short of my brewed coffee. It would be great. Then I discovered that, while there are about six Starbucks at the half a mile mark, there is not a single one inside that radius. D’oh! 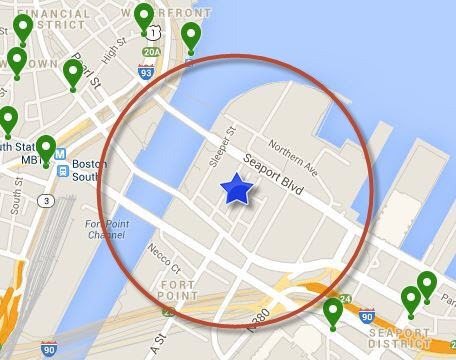 How is it possible to be this far from a Starbucks in Boston? So anyway, if you have some local coffee shops you’d like to protect in your neighborhood, can I recommend that you hire me/sell a house to me? I can all but ensure there will be no Starbucks in your town then!